ADT alarm systems utilize both cell radio and landlines, which they use as a primary or backup connection to their emergency monitoring centers. The cellular connection is usually used as a primary communications tool while landline connection is used as a primary means for communication mostly in rural areas where cell radio is not available. ‍ADT Starter Kit includes security panel and keypad, motion sensor and two entry sensors, and indoor camera and key fob. You also get a security camera installed and the ADT Go app with family location sharing. They use infrared motion sensors to detect indoor and outdoor motion. Customers can setup their alarm to ignore objects that weigh less than 40 pounds or 80 pounds, thus making the alarm system pet-friendly. ADT’s alarm systems for business and home use are able to monitor and detect excessive heat levels, carbon monoxide, and smoke within a house or office. They also have sensors detecting water leaks. You can also install video cameras for indoor and outdoor surveillance. A dedicated mobile app enables customers to view live stream from a video camera on a mobile device. You can automate the tasks performed by ADT access control alarms, home door locks, and commercial door alarm systems. ADT Pulse, their most popular plan, also provides features such as lights and thermostats automation, a functionality that helps you save on energy. Customer can take advantage of medical alert pendants featuring built0in GPS tracking. The device detects when a person fails and automatically connects to an ADT emergency center, no need to press a button or issue a command to connect. ADT can also send an emergency team to the exact location of the accident by using the GPS coordinates submitted by the device. ADT Pulse is a home and office automation offer that enable customers to setup custom rules based on event. Commercial door alarm systems can turn a lamp when you open the door, for instance. Recurring events are available such as “open the door for the babysitter at 9 am every business day”. ‍Screenshot of the ADT remote monitoring and management app showing the state of items included in the automated procedures and alerting about abnormal state of an item that is being monitored. You can also monitor the behavior state and the activity of the items covered by the automated procedures. You can also add devices to ADT Pulse by yourself. Learn how in this video. 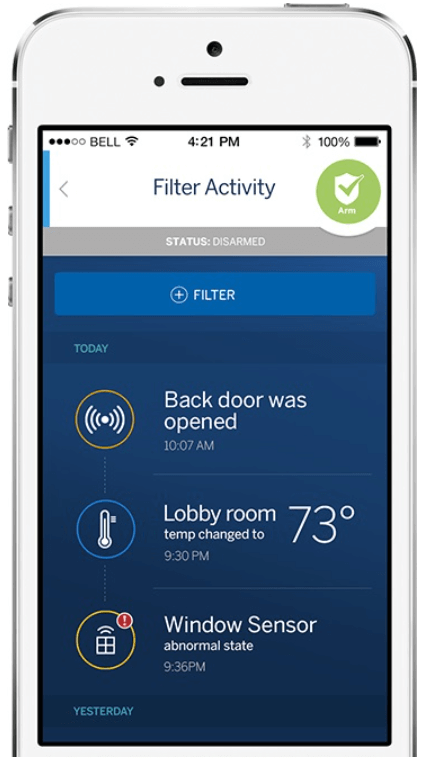 The basic plan for ADT Pulse start at $28.99 a month and, according to PC Magazine, provides lots of features like automation of locks, lamps, video, household appliances, as well as heating and air conditioning. Their Remote Arm Package is the entry level ADT Plus offer and costs $47.99 per month. The services includes 24/7 monitor, fire monitoring, and smoke monitoring. The packages offer remote web and mobile access, remote arm and disarm, email alerts, text alerts, and a service plan. You get a standard non-touchscreen control panel, two door sensors, one motion detector, and functionality to monitor and check the status of your alarm through a cell phone.